My gran moved from assisted living into the nursing home proper last month. Due to the move, I inherited some of her craft and sewing things. It felt strange going through all of her old craft bits and bobs, since I like to think of her as she was: incredibly talented and endlessly creative and not as she is now, and I feel a little bad shifting through things that used to belong to her, picking out what's worth keeping and what to chuck. I still feel like these things do belong to her, even if she has no need or use for them now. Despite the sadness of knowing why these things came to me, they do bring back a lot of happy childhood memories too. 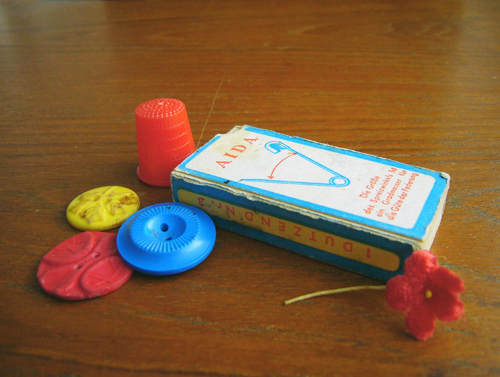 I remember playing with gran's buttons, sorting them into different piles or just admiring the pretty ones. I remember many a glorious summer sitting in gran's craft room sewing up toys and clothes for my dolls. And most of all, I remember watching my gran do all of these amazing things and thinking that that's what I want to do, that I want to create such wonderful things too. Gran did so much when she was younger. She sewed most of her own clothes and a lot of ours as well, wove on her loom that I rarely remember being without a warp on it ready and waiting, painted glass and porcelain, made jewelry, dyed wool with natural dyes in a big cauldron by the lake (she also taught this) and tended her gorgeous lakeside garden meticulously. She was very particular about her appearance and was always perfectly styled and coiffed. She wasn't vainglorious, but she did take a quiet pride in the things she did, knowing they were done well. I am still in awe of her creativity and she's one of the biggest inspirations in my life.